Fig Tree’s mostly French food lives up to its serene setting. 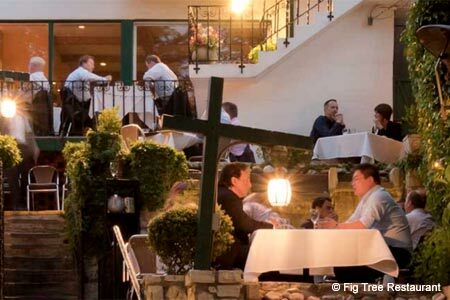 : Fig Tree’s location, on a bend in the San Antonio River, is one of the waterway’s finest. Tables are set with crystal and china, and the wine list is always of much-more-than-average interest with its selection of vintage Bordeaux and boutique bottles from the Pacific Northwest. Happily, with the arrival of French chef Laurent Rea, the kitchen is operating at a level fully worthy of the wine. Pan-seared diver scallops with squid ink risotto set the tone for entrées, which include Texas-farmed chicken breast with Parisian gnocchi, and Prime rib-eye. Beef Wellington may wow traditionalists; a starter of Hill Country quail stuffed with pâté and black truffles should seduce even the thrill-seeker, and a seasonal salad of heirloom tomatoes with pistachio-crusted goat cheese is to be leaped upon when available. Desserts include an inventive yuzu chocolate cake. The classically tableside-torched baked Alaska needs no further invention.